﻿ Bairnsley Highlands - Hihgland cattle coat colour - the D locus. 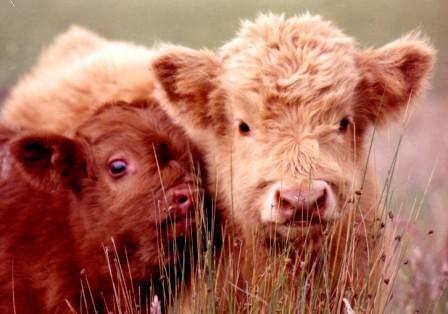 The D, or dilution locus is responsible for most of the lighter colours in Highland cattle (the gene is known as Dc). Some dilution genes will only dilute one of the two pigments, but we know from our breeding experiences that the one affecting Highlands is able to dilute both the red pigment (phaeomelanin) and black pigment (eumelanin). The dilution gene is SILV, previously known as PMEL17, on chromosome 5. When a particular mutation is present in the homozygous state (Dc/Dc) in Charolais cattle, on top of the red pigment (e/e), this gives their white colour and pink skin. This gene is thought to be involved in Simmental colouring and a mutation of this has recently been shown to be the dilution gene causing all the lighter colours in Highland cattle (7). In a comprehensive paper published in August, 2007 (6),the authors did some further work on the Dc allele with Charolais X Holstein cattle and came up with the following general concepts. Add one Dc gene to black (Dc/d+) and get medium grey (or dun), and add two genes (Dc/Dc) to get a near white colour. The same happened with animals that were red (e/e) that were diluted to get yellow (Dc/d+) and white (Dc/Dc). This paper on Charolais (6) cattle also noticed that on rare occasions the DNA analysis did not match up with the actual colour of the animal, similar to the way we sometimes get some unexpected colours with our Highland matings. In these cases they discovered a gene locus at the end of chromosome 28 that appeared to account for these variations. The presence of this 'Dc modifier gene' caused colours to look lighter than their genetic make up at the D locus would suggest. That is, a yellow animal can appear yellowy-white if they are Dc/d+ and they have this modifier gene on chromosome 28. The authors also suggested other modifying affects that could be responsible for increasing the intensity of the pigment (causing a yellow animal to appear nearly indistinguishable from a red animal). This may certainly help to explain some of the aberrant results that you get with some Highland matings where the lighter colours are involved, although in the Charolais study, 93% of the cattle had genetic make ups that exactly matched their colour. 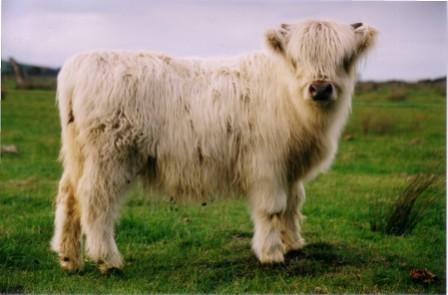 The white colour was once thought to be independent of dilution genes, possibly at a different gene locus in some breeds, but is now thought to be related only to these dilution genes in Highlands (Sheila Schmutz, personal communication). It is simply a lack of both black and red pigment. 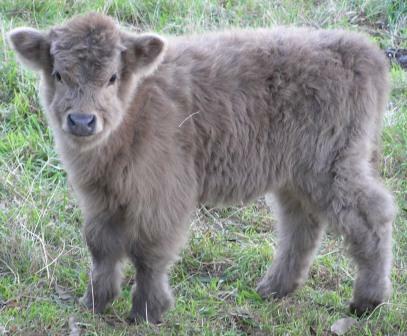 As if this wasn't confusing enough, not all Highland calves will show their true colours in the first few months of age (see article on calf coat colours). Besides making the filling out of registration forms tricky, this is quite an intriguing stage to observe in Highlands, especially calves with the black gene present, or mahogany calves.